Keeping a wild animal such a mongoose as a pet is iffy at best. As the mongoose is already present in force in Hawaii and Puerto Rico, there's no problem keeping one as a pet there. How how many are kept illegally in the rest of the United States is anybody's guess -- nobody's likely to advertise that. The mongoose is a member of the civet family, smaller than a domestic cat but larger than a squirrel. This carnivore preys on small rodents, birds and reptiles, and it can threaten the ecological balance of a habitat. They were introduced to Hawaii and Puerto Rico in the late 1800s to control rats on sugar plantations. This project was ineffective because a mongoose hunts in the daytime, while rats come out at night. Instead they ate native lizards and birds -- and their eggs -- to the extinction of several species. In Puerto Rico they also ate snakes. In North America the mongoose has been prevented from establishing a breeding population except on tropical islands. There they do some $50 million in damage a year, principally to the poultry industry. The Lacey Act of 1900 forbade importing only the small Indian mongoose (Herpestes ailuropunctatus). The same act as amended up to 2006 lists 7 of 19 species of mongoose (at least 30 species are known) as injurious ones for which no import permit can be issued. The U.S. Department of Agriculture's Animal and Plant Health Inspection Service has no health requirements for the importation of mongooses, except those that have been inoculated with a pathogen for scientific purposes. If you can obtain a mongoose that is not on the federal banned list and is not intended for a research laboratory, you might be able to get a permit to keep it as a pet. There once was a legal mongoose in the continental United States. Mr. Magoo, an Indian mongoose, came in on a freighter in 1962 and was donated to the Duluth Zoo. The feds heard about him and passed a death sentence; apparently they feared he would flood the nation with babies all by himself. After a public outcry, he was pardoned by President Kennedy. He lived at the zoo as a legal temporary resident until he died in 1968. Some state haves strict rules for the keeping, housing and maintenance of captive wild animals. Florida requires that you be at least 16 years old, obtain a permit, be examined for knowledge of the animal and its needs, and provide quarters and diet as described in exhaustive detail. Texas is less demanding, requiring a license to possess a "dangerous wild animal," but the mongoose is not on that state's no-no list. If you got to that level, you would still need to conform to any county/parish and municipal ordinances related to keeping a wild animal as a pet. Befriend a young mongoose in the wild, where he is free to come and go and socialize with humans and other mongooses, and you will have a good friend who will help keep your house free of pests. Take him out of his native habitat, confine him to a cage and limit his associations to humans, and he might not be so consistently friendly. 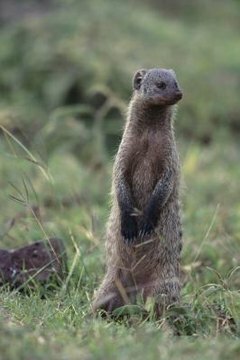 Not all your friends will enjoy having a mongoose run up their legs (covered or bare), sit on their shoulder, chatter in their ear and nip them if they try to touch him. A group-living mongoose will suffer from isolation, and the solitary type might have differences with other pets. It could be difficult to get appropriate medical care for such an exotic pet. Wild animals tend to make poor pets for all but the few who are willing to accept their instincts and habits, and to overlook or treasure their unpredictable and uncivilized behavior. Gemini Geek: How to Get Rid of Mongeese? What if You Are Caught With a Capuchin in Florida? Can a Serval Be Kept as a Pet?